• Is Science Cool? While 89 percent of students think science is “cool,” only slightly more than half are considering pursuing careers in science, technology, engineering or math (STEM). • Patriotic Relevance: India ranked highest (82 percent) for those who believe it’s very important for their country to lead the world in science. In contrast, students in the US, UK and Canada and the UK trailed at 73, 60 and 55 percent, respectively. • Would you rather travel to the Moon or the Earth? A majority of students (57 percent) would rather travel anywhere on Earth than the Moon if given the chance. • What’s the road block? The two most common reasons for hesitating to pursue a career in STEM—lack of confidence/ ability to do well and too much work. So how do we get kids excited about science? 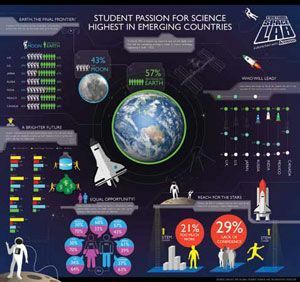 Global competitions like Lenovo’s with YouTube Space Lab are one way to provide mentorship, engage students and expose them to realworld examples of science in action.